Gangways are narrow passages that provide access from dock to ship. Telescopic gangways designed by Prosertek provide an optimum and safe way for bridging installations, even during the roughest environmental conditions. Our products are designed to meet our customer’s highest requirements, and can be supplied in different configurations: as tower type or column type, or even our advanced passenger boarding bridges, with their engineered systems focused on compensating the relative movements between the interconnected elements and the different height in between platforms. The purpose of this equipment is to facilitate the transit of people ship-to-ground, for terminals related to oil and gas industry. Features of the berth (crown height, tide races). Characteristics of vessels, their drift once berthed, etc. The designs may be of column type (Gangway) or tower type (Catway). The tower system incorporates a mobile element with elevator technology that allows to extend the range of action in a vertical direction. Likewise, the telescopic system of the aluminum access ladders and the different tilting and turning devices will enable a full operational capability. The facilities devoted to the manufacture of our gangways are in Europe, where we have a specially prepared platform to simulate the final installation of the gateway completely assembled and perform a complete check-list prior to delivery to its final destination. Our telescopic gangways can be supplied with different configurations adapted as closely as possible to the requirements of each port. 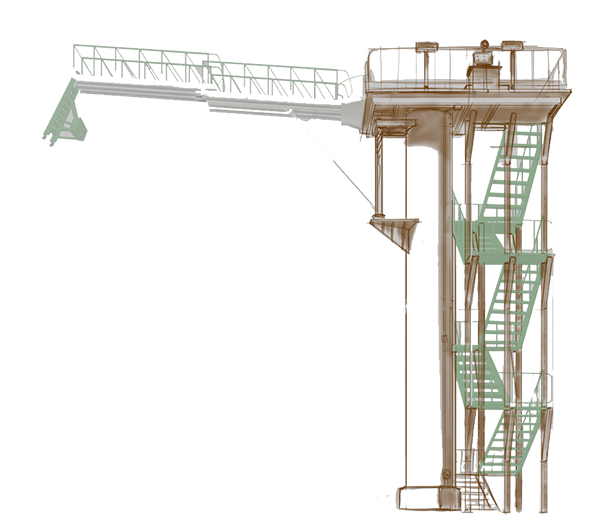 Operating modes, actuators and angles of movement, handling and control, elements and regulations for telescopic gangways. Prosertek has installed its telescopic gangways in different national and international ports. Here are some our our latest references.